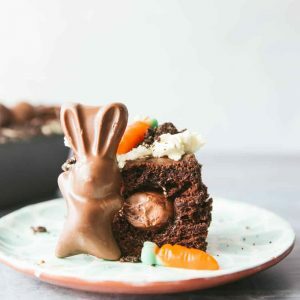 You are here: Home / Cake / Easter Chocolate Poke Cake With A Hidden Surprise! Chocolate Poke Cake is so easy to make, use Betty Crocker’s Devil’s Food Cake box mix for the cake base, combine condensed milk and dark chocolate for a decadent filling, and top with fresh whipped cream. Inside the Chocolate Poke Cake I’ve hidden small Cadbury Creme Eggs and to top it all off there are crushed Oreo biscuits, Malteeser bunnies and jelly carrots! 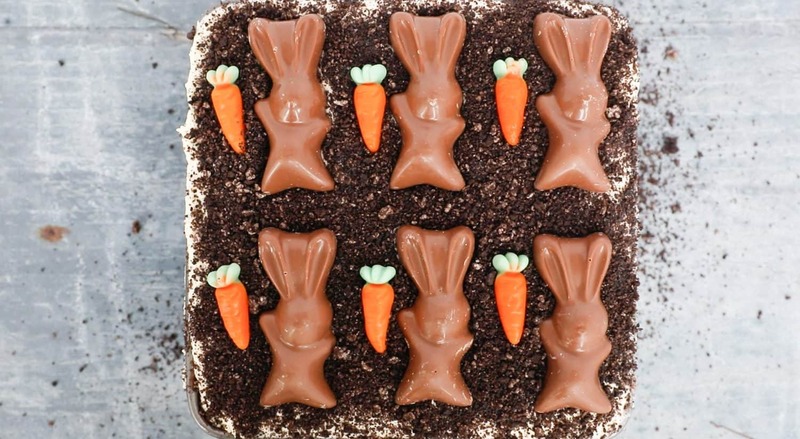 For this recipe, you will need: Betty Crocker Devil’s Cake mix, eggs, vegetable oil, water, condensed milk, dark chocolate, small Cadbury Creme Eggs, double cream, icing sugar, Oreos, Malteeser bunnies and jelly carrots. As Easter marks the beginning of spring it is a time when so many of us get creative in the kitchen. I’ve made lots of Easter sweet treats lately and my family and friends have certainly enjoyed reaping the benefits! I love the idea of getting everyone around the table at Easter time and having an impressive dessert to present. Chocolate Poke Cake is so simple and quick to make, and perfect for an Easter get together. 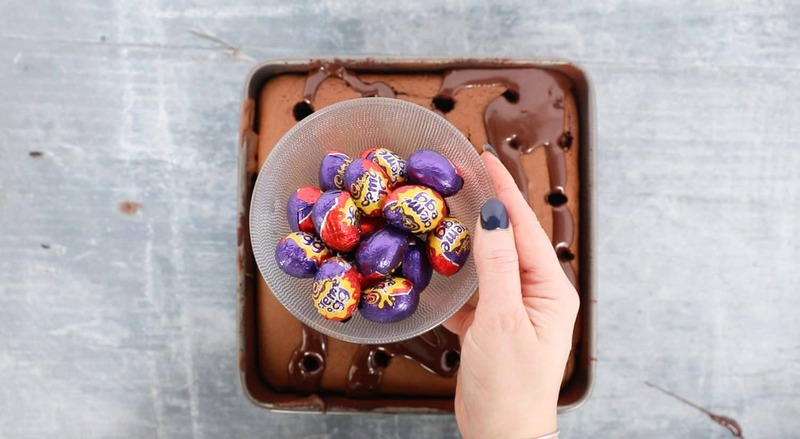 I’ve customised my go-to poke cake recipe but if you’re reading this and Easter is a distant memory you can leave out the Cadbury Eggs and keep the topping plain. The recipe is really adaptable for any time of year and if you’re a chocolate lover then this one is for you. It is a very rich, fudgy cake with a lot of chocolatey extras. I suppose it is a bit like death by chocolate Easter style so if that’s what you’re into then I think you’ll love this. 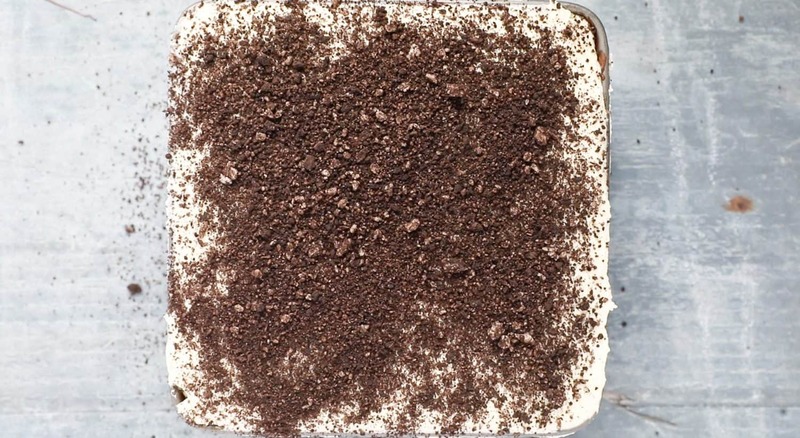 Popular in the 1970s a poke cake is basically a cake cooked in a pan and then poked all over with something round (like the end of a wooden spoon.) The reason for the holes are so the filling seeps through the cake ensuring it stays super moist and tasty. The filling could be anything from condensed milk sweetened with chocolate to jelly to hot fudge sauce. A topping is then added, such as chocolate frosting or whipped cream upon which you could add extra ingredients to just like the Easter decorations I’ve used. Chopped nuts or a scoop of vanilla ice cream are also great on poke cake. 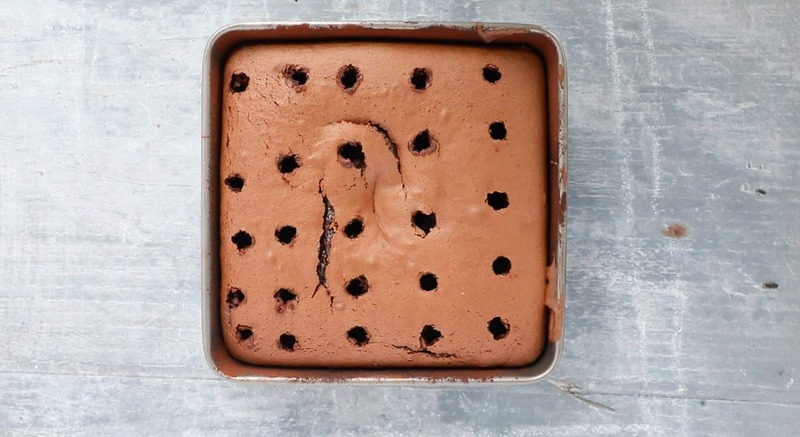 Can I bake a poke cake from scratch or is it better to use instant cake mix? You could absolutely bake the whole cake yourself from scratch! Ingredients in a box mix are just the dry ingredients you would use for an ordinary cake. The reason I used an instant cake mix for this recipe is for ease and convenience. Any regular cake recipe can be easily turned into poke cake by baking a cake, letting it cool and poking holes in it. You can switch up the flavours and filling ideas too. There are lots of different poke cake combinations to try. As I said there are lots of combinations for poke cake. Here are some of my favourites. Cake serves approximately 12-15 people. I can assure you there will be zero leftovers! 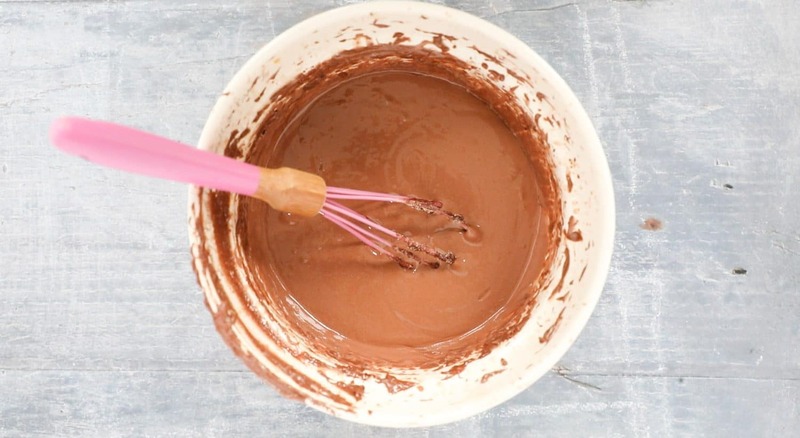 Pour the instant cake mix into a large bowl, add three medium eggs, 120ml vegetable oil and 230ml water. Mix until smooth and creamy. 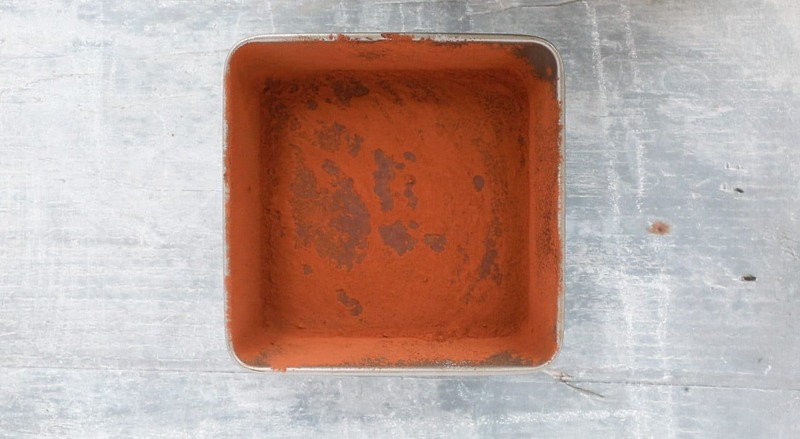 Grease a 20-inch square pan and sprinkle it with cocoa powder. 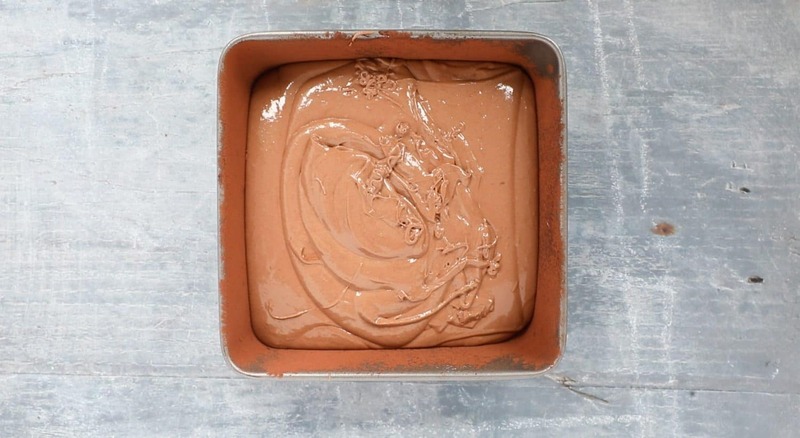 Give the pan a good shake so that it’s coated with the cocoa powder this will stop the cake from sticking. Pour in the cake mixture and bake in the oven for 23-28 minutes or until a skewer inserted into the middle of the cake comes out clean. Leave the cake to completely cool in the pan. Meanwhile, add a tin of condensed milk to a microwaveable bowl and heat it for around 30 seconds until it’s warmed through. In the microwave, melt 100g of dark chocolate in short 30 second bursts. 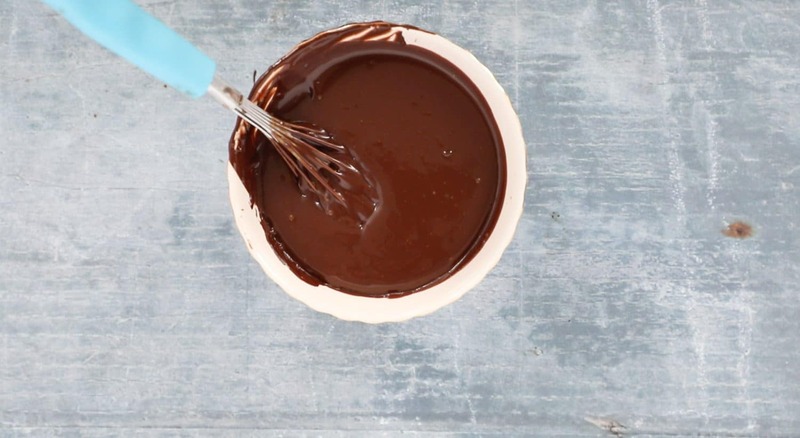 Once melted, pour the chocolate into the warm condensed milk and whisk until you have a smooth, glossy and pourable sauce. Once the cake has cooled, use the end of a wooden spoon to poke holes all over it. Pour half of the sauce into the holes and then set it aside. Unwrap the small Cadbury Creme Eggs and poke them into the holes. I used two packets of small Cadbury Creme Eggs in total. It doesn’t matter if you have more holes than eggs. Pour the remaining chocolate sauce on top of the cake and smooth over with a palette knife. Leave to cool. Whip 450ml of double cream until it has thickened then add 2 tablespoons of icing sugar. Take care not to let the cream curdle. You are looking for a smooth, spreadable consistency the same as buttercream icing: thick enough that it won’t slide off the cake. Using a food processor or rolling pin, crush 5 Oreo biscuits and sprinkle them over the top of the cream. Decorate with Malteeser bunnies and jelly carrots. 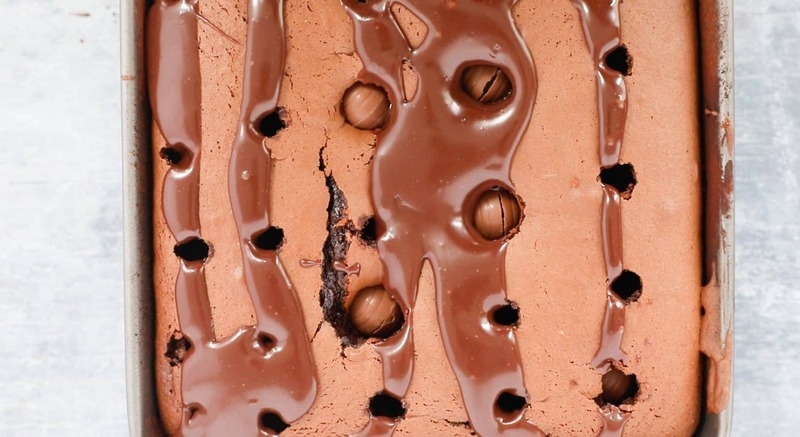 You will be serving this cake straight from the pan but I would advise not to use the Malteeser bunnies as a cutting guide. This cake is VERY rich and chocolatey and a small piece about half the size of a Malteeser bunny is going to be plenty! 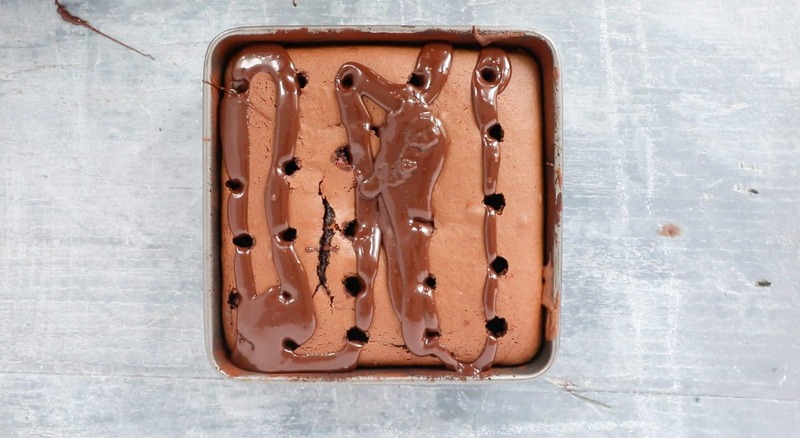 This Easter Chocolate Poke Cake is easy to bake at home and then take along to a family get together, barbeque, school fete or any other social occasions where a chocolate cake would go down well. If you love this recipe please give it a 5-star rating below and don’t forget to share your creations with me by tagging me on Instagram, Twitter or Facebook @amytreasureblog. 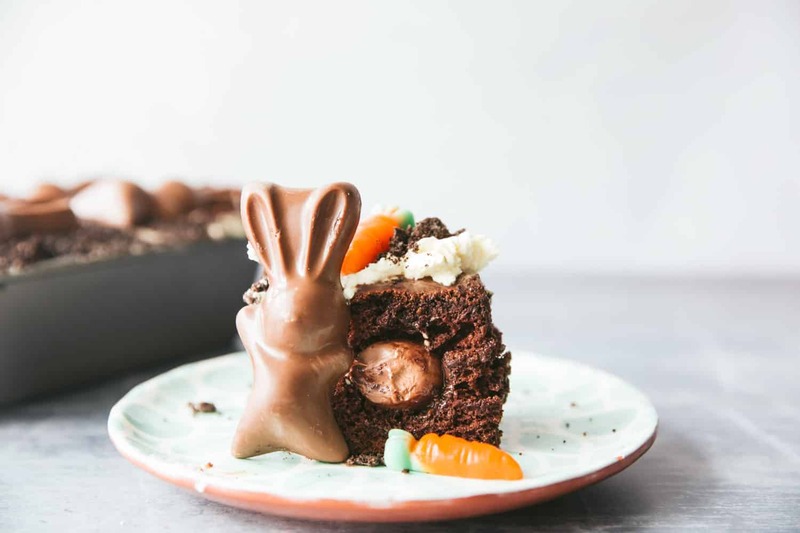 Death by chocolate Easter poke cake - a fudgy chocolate cake with a gooey chocolate filling, and hidden Cadbury Creme Eggs, topped with whipped cream and decorated with Malteeser bunnies and jelly carrots. This one is for the chocolate lovers! 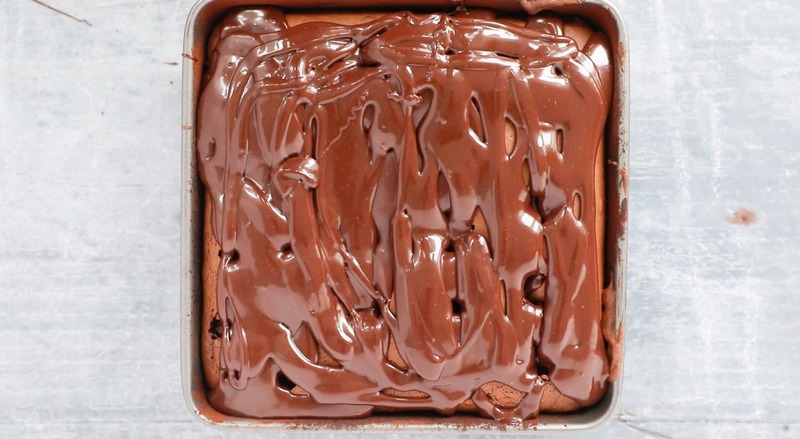 Grease a 20-inch square pan and sprinkle it with cocoa powder. Give the pan a good shake so that it's coated with the cocoa powder this will stop the cake from sticking. Meanwhile, add a tin of condensed milk to a microwaveable bowl and heat it for around 30 seconds until it's warmed through. Unwrap the small Cadbury Creme Eggs and poke them into the holes. I used two packets of small Cadbury Creme Eggs in total. It doesn't matter if you have more holes than eggs. Whip 450ml of double cream until it has thickened then add 2 tablespoons of icing sugar. Take care not to let the cream curdle. 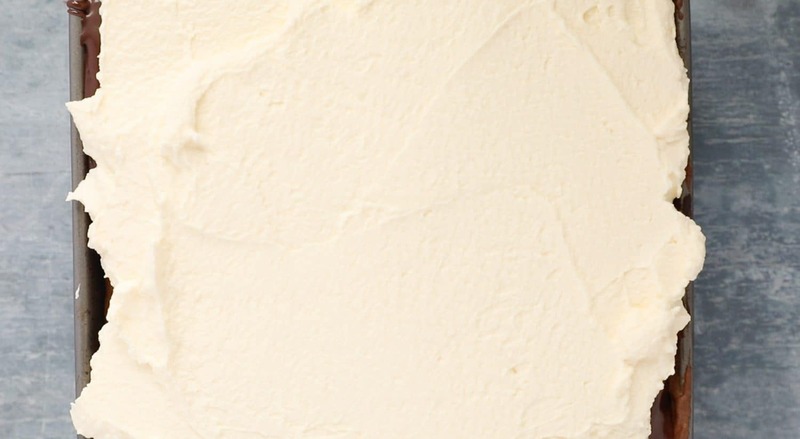 You are looking for a smooth, spreadable consistency the same as buttercream icing: thick enough that it won't slide off the cake.